EACH CHILD! Nearly $80 FREE. Please share with friends or family thinking of starting swimming lessons! Can be used in conjunction with the ‘Introduce a friend’ offer! April-August 2017 only. 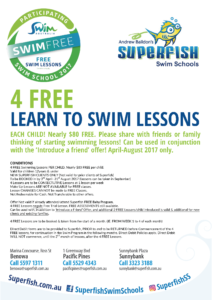 4 FREE Swimming Lessons PER CHILD. Nearly $80 FREE per child. Valid for children 12 years & under. NEW SUPERFISH CLIENTS ONLY (Not valid for prior clients of Superfish). To be BOOKED in by 3rd April- 31st August 2017 (Lessons can be taken in September). 4 Lessons are to be CONSECTUTIVE Lessons at 1 lesson per week. Make Up Lessons ARE NOT AVAILABLE for FREE classes. Lesson CHANGES CANNOT be made to FREE Classes. Not Redeemable for Cash. Not Transferable to other offers.Offer Not valid if already attended/attend Superfish FREE Baby Program. 4 FREE Lessons negate Free Trial Lesson. FREE ASSESSMENTS still available. Can be used with, in addition to ‘Introduce a Friend’ Offer, and additional 2 FREE Lessons/child introduced is valid & additional for new clients and existing families. 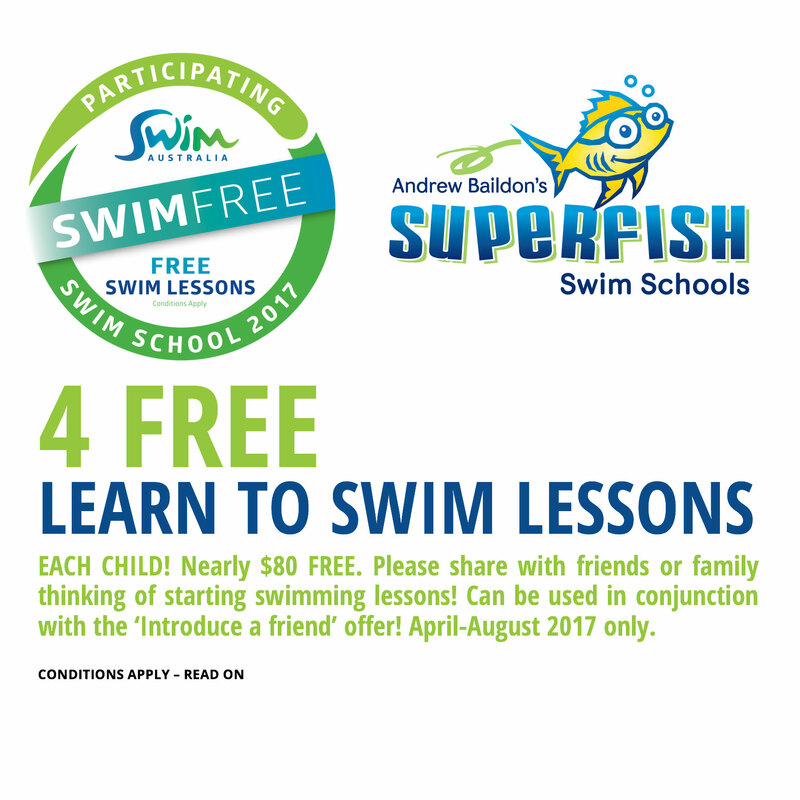 Direct Debit forms are to be provided to Superfish, PRIOR to and to be RETURNED before Commencement of the 4 FREE lessons, for continuation in the Swim Program in the following months. Direct Debit Policies apply. Direct Debit WILL NOT commence, until the 2nd month of lessons, after the 4 FREE Lessons.